Uvita Bed & Breakfast Cabana Business with Owner’s Home. Own an eco-friendly bed and breakfast business in the lush rainforest jungle, complete with your own 2 bedroom/1 bath owner’s home to conduct business from. Nestled 1,200 feet above sea level, this 10-acre property is right next to a mountain, allowing guests to encounter lush rainforests and local wildlife on a daily basis. 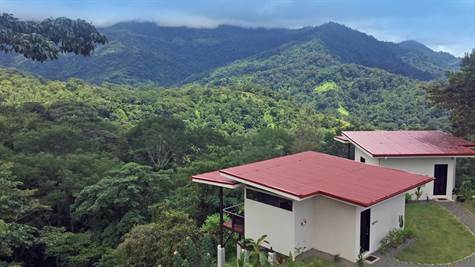 The property features its own landscaped and maintained hiking trails so tourists will be able to experience a colorful jungle and local wildlife. Your 2-bedroom owner’s home includes a large eat-in kitchen, complete with stainless steel appliances, slate-grey stone countertops, including a kitchen island, and a picnic style dining room table. The white curtains and hanging lanterns allow a cool breeze to enter and keep the kitchen light and airy. The master bath includes the same grey-slate countertops, a double vanity, and a double shower with two shower heads. The house also features a large balcony so you can relax outside any time you desire. The property features four 500 sq feet rental cabanas, featuring majestic views of the rainforest and the ocean. Each of the private cabanas fits up to adults and features a variety of luxurious amenities, such as kitchenettes with a mini refrigerator, free in-room WI-FI, and free parking. Each cabana includes a king-sized bed, with high-quality cotton sheets so you that guests get a good night rest after exploring the area. They also feature 180-degree views of the jungle and a luxurious spa shower facing the jungle. All of the cabanas feature private patios or balconies, complete with a comfortable hammock and two lounge chairs. A communal area, known as the Pineapple Lounge, provides guests with a luxurious outdoor space in which to socialize. It features a full kitchen, BBQ grill, and dining area. Guests can enjoy breakfast, Costa Rican coffee, and homemade smoothies while watching the sunrise over the nearby jungle. You may even spot some wildlife in the trees. The Pineapple Lounge is a favorite hang-out throughout the day since you can grill locally-caught fish on the BBQ grill or prepare lunches from groceries bought at the store at the end of the street. The Pineapple Lounge also includes an outdoor pool, lounge area, and deck mats, perfect for doing some yoga right by in the sunshine. This communal area allows you to sip frosty drinks, make some new friends, and just enjoy the sights and sounds of Southern Costa Rica.